We celebrate a united, inclusive and diverse environment, where all members have a voice. We believe that the more we share, the better off we all will be. We create a safe place that inspires our passionate membership by providing the freedom to experiment and express, a principle our nation was built upon. We understand that each individual has unique talents, strengths, and roles, but that we can only succeed as a team when all members work together. We embrace the possibility of failure but know that failure is never final. Only through learning and perseverance can we get closer to achieving excellence. We do not make excuses. In a pursuit for excellence, always pushing back limits and with the passion for progress, we will constantly challenge the status-quo and find innovative solutions and creative ways to improve our environment. We honor open, timely and proactive communication and trust that the exchange of ideas, information and talents will inspire all members of our community to achieve excellence. 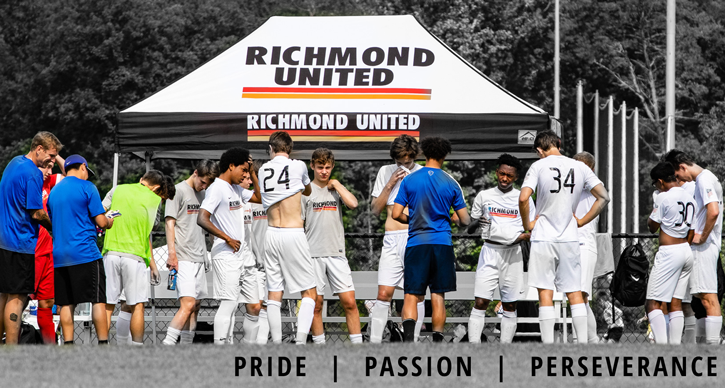 We believe that inspiring our members and achieving excellence will unite our soccer community in which our passionate members can proudly represent Richmond United.